On Saturday March 3, TTCriders had its annual Transit Summit to address some of the issues that have put the TTC in the media spotlight -- as well as some of the less visible issues. TTCriders has been a successful voice for public transit users in Toronto for many years. To the general public, they might be known for the sassy stunts that shame some reluctant Toronto city councillors into action on transit issues. 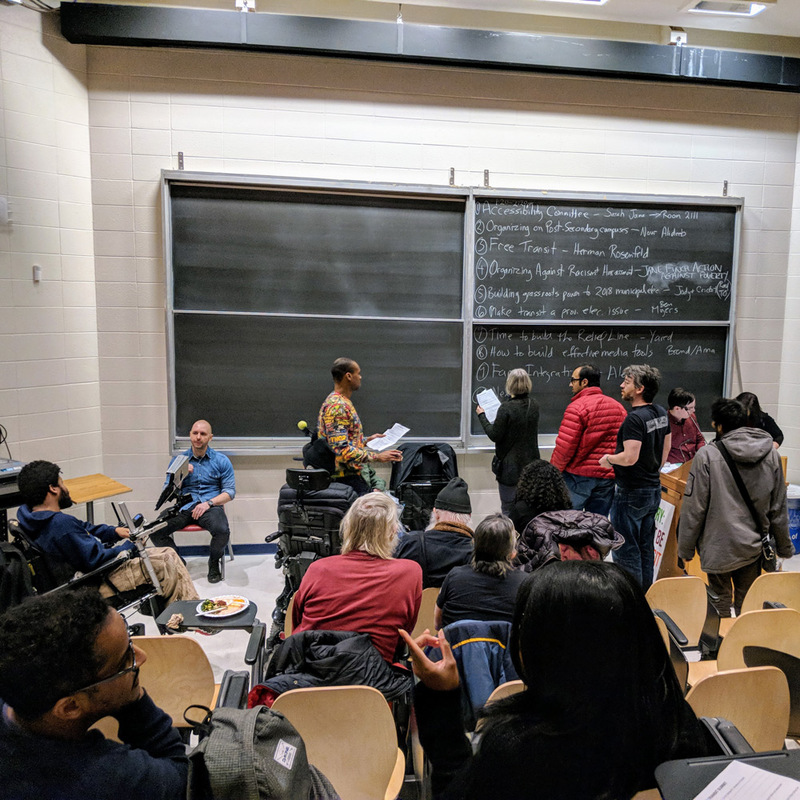 On Saturday March 3, TTCriders had its annual Transit Summit on the University of Toronto St. George Campus to address some of the issues that have put the TTC in the media spotlight -- as well as some of the less visible issues impacting transit in Toronto and beyond. Most recently, TTCriders brought attention to late-January overcrowding on the Line 1 subway in the form of the Overcrowding Relief Kit, which was featured on CBC, CP24, Toronto Sun and Global News. This is what you get after years – decades, really – of underfunding Toronto’s transit system and a collective failure to build subways where they’re needed most. It’s what you get when politicians make low-taxes-at-any-cost their top priority and all levels of government fail to come up with the money to pay for first-class transit in a fast-growing city. Influencing City Council votes in order to increase TTC funding and planning and were one overarching theme of the summit. In the morning, a session led by Melissa Wong, Director, Policy & Operations at the office of Councillor Kristyn Wong-Tam described several ways to effectively contact and pressure city councillors. Attendees submit their own session ideas and organize for the afternoon. There are 45 votes on Toronto City Council and 23 is the magic number to create change. As evidence by the recently passed status-quo 2018 budget which keeps property taxes at the rate of inflation and leans heavily on the unpredictable land-transfer tax, there’s an aversion to long-term planning on current city council and this is a key issue for the present and future of the TTC. In the afternoon, attendee-led working groups addressed accessibility, racism and harassment, the King Street Pilot Project, the Downtown Relief Line, fair fares and making transit an issue in this July’s provincial election. On the topic of the provincial election, TTCriders is considering several methods to support candidates in key Toronto-area ridings. Considering the influence that the provincial agency Metrolinx has over TTC fares and will have over future Ontario regional transit developments, the province will have a growing impact on Toronto’s transportation following the election. On more immediate issues, TTCriders will have a Sardine Ride rally on March 27 at Queen’s Park to further address the subway overcrowding from earlier in the year. This post wouldn't be complete without a mention of the Scarborough subway, which evoked a lot of emotion from several attendees at the summit. Particularly in Melissa Wong's session, a few attendees described their dumfounded reactions to the decisions that had been made for Scarborough public transit. Particularly, these attendees felt that data was being ignored in favour of political expedience. Coming to the centre of downtown from Scarborough on transit is no easy task. I would expect these residents to put in as much effort during the municipal election campaign in the fall. We'll only send you news and updates about the conference.